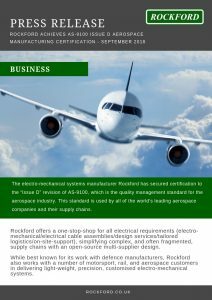 The electro-mechanical systems manufacturer Rockford has secured certification to the “Issue D” revision of AS-9100, which is the quality management standard for the aerospace industry. This standard is used by all of the world’s leading aerospace companies and their supply chains. 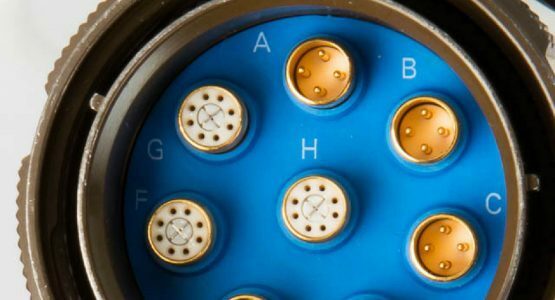 Rockford offers a one-stop-shop for all electrical requirements (electro-mechanical/electrical cable assemblies/design services/tailored logistics/on-site-support), simplifying complex, and often fragmented, supply chains with an open-source multi-supplier design. 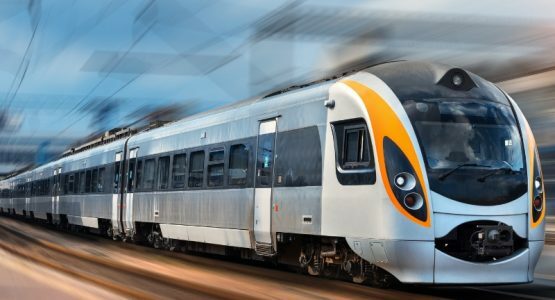 While best known for its work with defence manufacturers, Rockford also works with a number of motorsport, rail, and aerospace customers in delivering light-weight, precision, customised electro-mechanical systems. 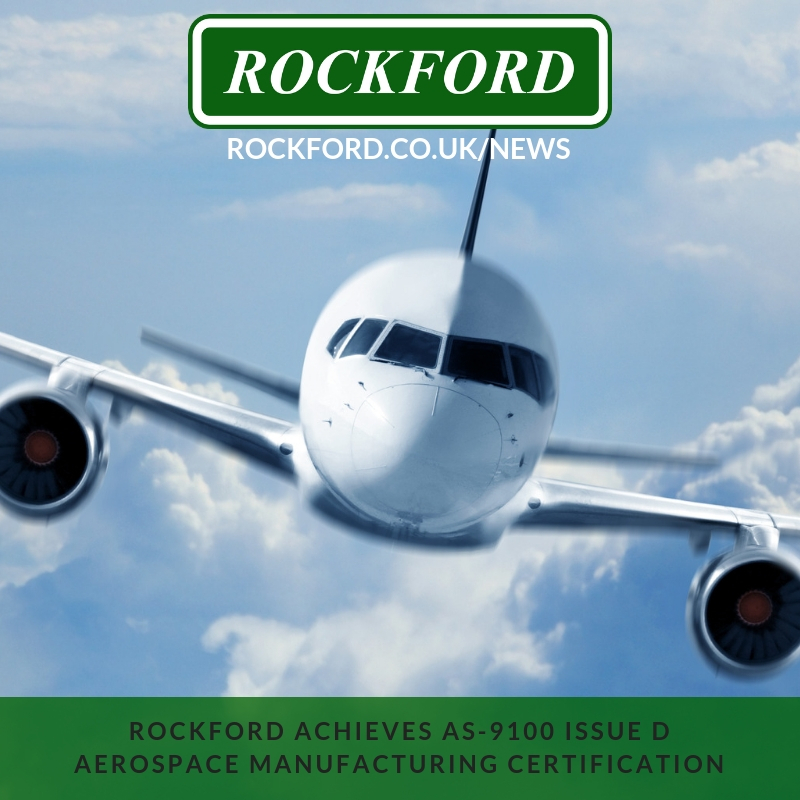 Rockford has been certified to AS-9100 Issue C since 2015, and in 2018 has successfully achieved the Issue D certification, which has requirements for organisational knowledge, counterfeit parts, product safety and human factors to risk analysis. Dennis Fowler, the Quality Director at Rockford, says that Rockford has been preparing for Issue D compliance since achieving Revision C status, as they’ve been aware of the upcoming changes for some time. He says one of the most important changes in Issue D is that quality management needs to be driven from the very top of the organisation, from the senior management team, to the department managers below them, and understood at every level of management beneath that. 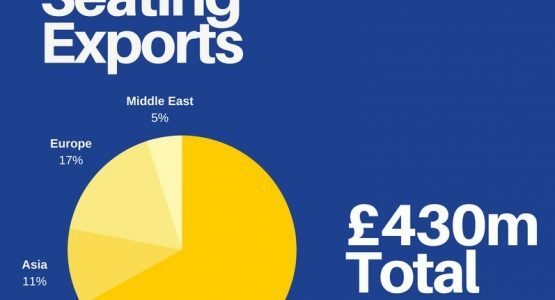 “You have to show commitment from the top, and show that everyone below the Managing Director understands their commitment to the quality management system and what they should be doing”, says Dennis Fowler. One major difficulty of adhering to Issue D of AS-9100 is that there is no golden standard example out there of how to approach adherence, as every business is completely different. Rockford considered hiring a consultant to assist in preparing for the compliance process, but as the consultant may have struggled to understand the business, their advice would have been fairly generic. Instead, Rockford sent three of its quality management personnel on a five-day lead assessor QA course for Issue D. They then used what they’d learned to build a compliance matrix for the business and follow every detail through step by step. The Issue D revision of AS-9100 focuses intensely on risk management at all stages of the manufacturing process. This revision asks businesses to really formalise their processes and address how they assess risk in project management, contract review, purchasing, daily tasks and every step of production, and to show visibly how that risk is being managed. Rockford’s QA team went through every step of every process in the business to identify positive and negative risks involved in each step of each process, and made judgements on whether something needed to be changed or not. One important thing the QA team at Rockford noted during this preparation was that batch traceability of personnel needs to be well monitored to ensure operators are performing tasks in the correct sequence. Rockford has long had processes to ensure operators have the correct training to perform the tasks they are asked to do, and to track who has completed each task and when. Another major change in the revision D issue of AS-9100 is in regards to the human factors involved in production. It’s no longer acceptable to talk about process failures as being a result of an “operator error”. Now, it’s more important to reconsider the process that led to that failure, and correct the process. For instance, did the operator pick up the wrong tool because it wasn’t labelled correctly? Did the guidance notes specify which tool to use? QA teams need to address the process behind the failure. In some cases, the process that needs addressing may be that the operator’s manager hadn’t noticed the operator wasn’t on form, and didn’t send them home for the day, or assign them to tasks that don’t affect the product realisation. So Issue D really forces companies to fix the business processes that lead to human error. Rockford holds daily meetings of 5-10 minutes long in all of the production teams to ensure supervisors and team leaders can see their staff before they begin work for the day, allowing them to assess their readiness for the day’s work. It also allows teams to discuss what the tasks for the day are, and to address any recent issues that have come up. Auditors for the Issue D revision certification found that Rockford had a very strong induction training program, and commended the visual guides for machining and good practices upheld in the metal work department. Rockford was also praised for having a robust contract review process involving engineering and supply chain teams. In the end, many of the adherence clauses of Issue D of the AS-9100 certification really just encourage aerospace businesses to hone their processes and become more efficient and reliable overall. This makes the process of adhering to the new revision very rewarding for the businesses that comply. Rockford’s team is extremely pleased to have put in the effort to obtain this certification, and to subsequently improve quality processes throughout the whole business. Rockford helps customers deliver highly ruggedised and complex platforms by integrating technology. Incorporating partnerships with top-quality manufacturers, Rockford is able to offer best-in-class electro-mechanical system solutions with bespoke designs for every customer.